Would you like to enter the world of Cloud Computing, getting rid of of the costs and risks associated with legacy and on-premise infrastructures? Rely on IES Solutions to develop your application in the cloud or migrate your data center to the cloud, or, at first, to integrate your existing data center with cloud solutions. Through a feasibility analysis, our cloud experts will offer you the best solutions customized to the specific needs of your business, migrating existing applications and systems, extending your network in the cloud or implementing a whole new infrastructure. Don’t worry about how to configure your environment to run your application, we will take care to perform the installation and configure your environment so that it can adapt to the growth of your business. Through a feasibility analysis, we offer you the best cloud solution that fits the needs of your company. Need a new software application? We design and develop your application directly on the Cloud. Want to get rid of legacy and on-premise systems? We move your data center to a Cloud infrastructure. Want to gradually migrate to the cloud? Maintain your data center and have part of the system in the Cloud. 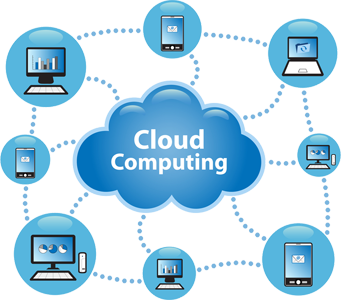 Cloud Computing is a set of technologies that allow the use and provision of software, the ability to store and process data via Internet through the use of distributed and virtualized resources on the network (Internet). Data and software applications do not need to reside on a computer, they may be “hosted” on the Internet or, as they say, “in the cloud”, allowing people to get rid of computers, sophisticated hardware and dedicated system admins. Cloud means “Pay-As-You-Go” i.e. pay only for what you use. This means paying the processing units for their actual use, according to an hourly rate. In this way it is possible to defer the costs of hardware purchase over time as if they were monthly payments and preserve the possibility to stop paying for these computing units when no longer needed. Pay for the use of a processing unit means getting rid of the problem of equipment failures and their aging. In case of a computing unit is inadequate it will be possible to migrate your data to another computing unit without having repair costs and in short time. By paying equipment for their use, you can always be sure that hardware performance are able to support the latest technologies. Thanks to the Pay-As-You-Go and scalability concepts, you do not need to worry about planning resources in order to make them support any growth of your business. When business grows you will need to add processing units allowing to scale your application and get more computing power. All this without any hardware investment, only using self-management tools available in the cloud. So you can scale applications only when necessary and save on the use of resources. Applications and services will be available 24 hours a day; have your own system in the cloud means to rely on strong data centers, located around the world, that provide reliable and always available internet connections. Your data are maintained in remote data centers and are replicated in various areas of the world to ensure their availability and durability. These data are maintained in a safe manner so that they can be used only by the owner. Data centers use state-of-the-art technologies for data protection from intruders. Moving your data to a cloud architecture means you can be sure that they are safe, more than they would be in your own datacenter. You can daily monitor the fee charged for each service you use. In this way you can plan the use of resources in the future and know in advance how much it would cost. The lack of infrastructures within the company leads to energy savings and lower CO2 emissions, thereby promoting a technology that respects the environment.